Robo-Squirrel is a Bionic squirrel who is able to bust down doors and steal the Honey Nut Clusters Cereal right out of the hands of unsuspecting families. 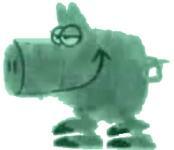 Robo-Squirrel was created by Peter Knowlton. Honey Nut Clusters Squirrel is pretty normal looking, cheery squirrel. A box of Honey Nut Clusters was featured in the movie "Wild Hogs". Tim Allen's family is seen reading the back panel which states, "Life's Short. Go Nuts!" Strawberry Shortcake was a popular doll who was licensed for her own cereal. They also tried short-lived test versions of her friends Blueberry Muffin and Orange Blossom. Orange Blossom (1981 only) was a friend of Strawberry Shortcake. This was an "artificial orange flavor frosted corn (puff) cereal". Pac-Man (1983) cereal was made to take advantage of the popularity of the video game by the same name. Pac-Man is a friendly yellow ball of a head with eyes, and a mouth. 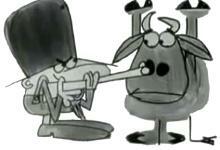 He generally has to avoid contact with four ghosts named Blinky, Pinky, Inky and Clyde. A Canadian box of yellow Pac-Man balls of cereal with Mrs. Pac-Man (white with pink bow) marbits was also produced. 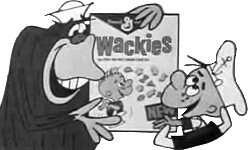 Wackies Boy and the Banana Wackies Gorilla appeared in 1965. We don't know the difference between regular Wackies and Banana Wackies since regular Wackies were described as an "all oat cereal with sweet banana flavor bits" in wacky shapes like "banana squiggles and banana squaggles" as well as "banana bingles and banana jangles, oflutes, oclots, and lots of other wackie shapes". Banana Wackies also had a singing elf for a spokescharacter in 1965. 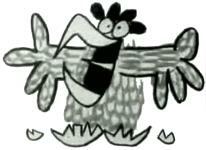 The General Mills Scarecrow appeared in 1963 and ran until about 1965. Rice was also an ingredient. This cast of characters appeared in a crazy 1960's General Mills Country Corn Flakes TV advertisement. The pig starts off bocking like a chicken, and ends with the Rooster hatching from an egg (kept warm by the Pig) and Mooing. Country Corn Flakes. They won't wilt when you poor on milk. They're double-toasted corn flakes made with rice. Use the search box at youtube.com and watch it for yourself. 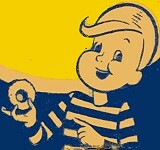 Cheeri O'Leary (1942) was the original mascot for Cheerioats. She provided biographical information on movie stars on boxes of Cheerioats. Cheerioats' first slogan was The Breakfast Food Youve Always Wanted! in 1941, followed by Cheer up with Cheerioats (1942), Cheerioats  for Fighters on the Homefront (1943), Cheerioats, the New Flavor King of Cereals (1944), Look! An Oat Cereal All Ready to Eat (1944). In 1945, Cheerioats was renamed Cheerios. Credit Fred T. Leighty, a former adman at Dancer-Sampler-Fitzgerald (now Saatchi and Saatchi) for the name change. Cheerios  the first ready-to-eat oat cereal. (1944) Joe Idea first appeared in print ads for Cheerioats in 1944, and by 1946 was appearing in ads and on side panels of Cheerios packages. (Cheerioats was renamed Cheerios in 1945). Get that Powerful Good Feelin..Power Os! (1960), The Big G stands for Goodness (1962), Go with the Goodness of Cheerios (1964). "Get yourself Go! Get Cheerios! Energy O's that help your grow! ", "Get Go power with Cheerios", "Come on strong with Cheerios", "Start feeling your Cheerios", "We're gonna start the day... the right way... the oat way... the oatier oat way... Gonna have a bowl of them O's. Gonna get a pow-pow-powerful... good-good feelin' from cheer-cheer-Cheerios", "When you go for the goodness, you'll go for Cheerios", "Put a little cheer in breakfast with cheer-cheer- Cheerios", "The taste kids go for...", "Cheerios have holes. 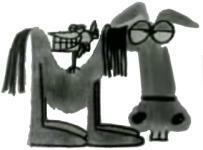 And a whole lot more", and "So get up and go with Cheerios" (all 1969-1970). Nutrition. Thats the Cheerios Tradition (1971), and Oats, the Grain Highest in Protein (1971). The image on the right is from a 1973 box of Cheerios. 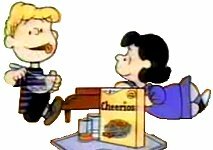 Charlie Brown, Linus (not shown), Franklin, Schroeder, Lucy, and Snoopy could be seen in ads for Cheerios. "You're on your toes, with Cheerios". Mr. Wonderfull (1972) was a clown-like character with red hair, a blue top-hat with a built-in periscope, and a purple polka-dotted white sport coat worn over a red turtleneck shirt. His surprise was the creamy vanilla or chocolate flavored filling inside each corn-and-rice puffed cereal shell. Sprinkle Spangles Genie represented Sprinkle Spangles Cereal for a very short time in the 1980's. "You wish it, I dish it!" Ice Cream Jones (1987), wearing an olde time ice cream fountain outfit while pedaling his bike with an ice cream freezer on the front, serves up the "sweetened cereal scoops with crunchy cones" found in this vanilla-flavored (1987) or chocolate-flavored (1987) cereal, while singing "My name's Ice Cream Jones, and I'm deliverin' my ice cream cones. New ice cream cereal for breakfast, with the great taste of ice cream cones!". A chocolate-chip cereal was also produced. Circus Fun Clown (1986) encouraged the animal shaped marshmallows to jump into this "crispy sweetened fruit flavored cereal". 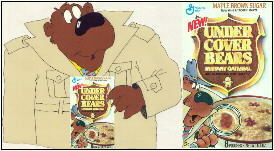 The Under Cover Bears (1990) were private eyes. There were four varieties of oatmeal: Strawberry, Maple Brown Sugar, Private Eye Variety and Super Sleuth Assortment "with bears made with real fruit" (like a gummi bear) and enrobed with oatmeal cereal. When hot water was added and was stirred, the bears became visible. From 1974 to 1977, Big G had a Magic Hat top hat character for Magic Puffs, a candy-coated cream filled puff. The WHIZ comic-book heroes Captain Marvel, Ibis the Invincible, Crime Smasher, and Golden Arrow fought master-criminals and represented Wheaties in the late 1940's. Lou the Kangaroo had his own cereal in 1968.
graphics to add, I would like to hear from you. Please e-mail me. Thank you for visiting. Aloha! Disclaimer: This is a non-commercial site with the sole purpose of assisting visitors in locating information on their favorite breakfast cereal characters. All of the names, characters, brands, and icons listed here are trademarks of General Mills or their respective parent companies and cannot be used for commercial purposes. Robo-Squirrel is a creation of Peter Knowlton. Enjoy General Mills cereals and support your favorite characters! Most of the non-icon images on this site have been painstakingly removed from cereal boxes or original advertising cels and enhanced for your enjoyment. You are welcome to link to this page, but please do not link to any individual images or borrow any images for use on another website. Thank you.